Walt Disney was a genius. No doubt. That little mouse he created has made him and his heirs billions of dollars. The mouse and his crew have brought joy to children for decades. Mickey Mouse is an American icon. 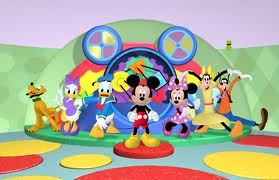 It seems like the Mickey Mouse Clubhouse television show is on perpetually in my house. I have tried to convince SJ, my six year old, he’s too old for the show and he should consider other programming options. He’s not budging. So, while I was familiar with Mickey Mouse and his friends before this obsession – they are icons you know, I have gotten to know Mickey and crew on a deeper level over the last few months. This more frequent association has led me to a few questions and observations. Let me run these Mickey Mouse questions and thoughts by you. Why doesn’t Pluto get to talk? How come he walks on all fours and actually behaves like a dog, when Goofy gets to talk and stand erect? My wife decided that Goofy had a mother who advocated for him at school. I believe Pluto never got early invention. Despite being able to walk and talk, Goofy is stupid. Sure, you would think this goes with the name, but he’s not goofy – he’s just dumb. I’m a teacher, and I understand such things. How many times does Goofy have to be told that to get a mouseketool, you have to say, “Oh toodles?” This leads me to question how Walt Disney felt about dogs. He must have been bitten by a dog at some point. Then, there is Pete. SJ insists that he is a cat. I don’t know how he knows this. Also, is he a good guy or a bad guy? It seems to change with each episode. I find this confusing. Donald Duck is generally just trouble. He adds little, always screws everything up, and is occasionally cranky. Minnie is extremely girly and a good friend. Daisy comes up with many good and helpful ideas. She is by far the smartest and most helpful in getting the job done. Then, there is Mickey – the ring leader. He’s perpetually happy and goal oriented. This is Walt Disney’s version of a motivational speaker. Too many Mickey Mouse questions and thoughts. I think way too much about this. I may have lost it. I really have to get control of that remote. January 22. Thirty five days. Five weeks. Time is all relative. If you suffered with headache for five weeks, that would be excruciatingly long. If you’re marriage lasted five weeks that would be ridiculously short (Hollywood short). Five weeks is how long I have been posting my blog exclusively from my website. It probably comes closer to the marriage scenario though in some ways, it has been more like the headache. Anyway, I’d like to tell you that things have gone so smoothly and just as I would have hoped. However, I would prefer to tell you the truth. So, in honor of the upcoming holiday of Passover, here are the 10 plagues that have happened since converting to a website. To be honest, many came simply due to my ignorance about the process. You would think that being a teacher I would strive to learn and ask questions before doing something. Well, in this case you would be wrong. Website – okay sure. I guess it is time. I hope this list will help those of you who may be considering going to a website. 1. Only those who were having the blog come right to their email came with me on the move. That was only about one fifth of my followers. I had no idea this was going to be the case. 2. I made the announcement I was moving only after the mass majority of these followers had disappeared. 3. Comments I have made on the sites of others have not consistently appeared. 4. I only see the reply to my comments if the person is a subscriber to my blog. 5. Some people have made comments that I never saw. The only reason I know is they emailed me and asked me what’s up? 6. I am not especially photogenic. Well, I actually knew that before. 7. People like a like button. However, the like button I have is not so clear. Truthfully, I don’t even know how it works. 9. I have gotten bombarded by spam (I don’t need Viagra, discounted, or not). 10. The water turned to blood. Actually, I made that up in honor of original plauges. Despite, these plagues, there has been many good things that have occurred since I have converted my blog into a website. First and foremost, I have had a chance to have a number of guests. I would like to thank my blogging friends, Kate (Did That Just Happen? ), Elske (Elske Newman), Jessie (Jessie Clemence), and Penney (Authentic Life Journeys). I also would like my writing group members who provided me with guest posts – Ronit, Frank, and Rachelle and my friend Robert. I also would like to thank my wife, Sara, for her awesome post. Lastly, I’d like to thank the Academy. Uh, wrong speech. I have learned a lot since I created the blog and have come to realize how much more I have to learn. One thing I have learned is how generous some people can be with their time. I have been truly touched by how helpful some people have been just because. I have taught a book to my 9th graders entitled Speak by Laure Halse Anderson. The book begins on Melinda’s (protagonist) first day as a high school freshman and ends in June. The book focuses on how she deals with the repercussions of a terrible incident that occurred in the summer (before h.s.) that caused her to be an outcast. Ultimately, she finds a way to get past the incident and become a stronger though different person. One way this is done is through the motif of a tree. The tree struggles in the winter months and even has to have some parts cut away so that the rest of the tree can survive. I’d like to think of my blog and website as the tree. Many followers have been lost. The tree has lost some limbs. However, the most loyal – let’s say the trunk or the roots have followed me over to the website. I have met some new people and feel there is potential to do so much more. So, as Spring is on the horizon, I am optimistic about growth. I thank you who have continued on this journey with me. I look forward to your responses, input, and sharing. Today is the third and final part a series featuring the other members of my writing group. Rachelle, our frequent host who makes great popcorn, is up today. She writes poetry and prose that typically focuses on her family. Rachelle is a Marketing Communications Manager at a publishing company. She describes herself as a 40 year old suburban mom who enjoys reading, decoupage and rollercoasters. I never expected to be someone that is shy about their age. But now that I am firmly entrenched in the throes of middle age, I have grudgingly become that someone. It wasn’t always this way. When I was a kid, birthdays were exciting occasions with parties, presents, cake, and 25 of my closest friends. As I got older, I proudly celebrated all the birthday milestones that really mattered- my Bat Mitzvah, being old enough to drive, to vote, and to drink. But somewhere around that quarter century mark, birthdays just started getting tiresome. By age 30, they were starting to hurt. Turning 40 sent me into a tailspin, and I had a minor mid-life crisis. I couldn’t afford to buy a sports car or take an expensive vacation. I was far too chubby and lazy to have a steamy affair. So, I decided, that was it. I put my foot down. The buck stops here. From now on, I’m turning 40. I may be old and grey and drooling in the old age home, but I will still be 40. Funny how age works. While I readily admit to being age-averse, I would never want to go back in time and relive my more energetic youth. Although I wouldn’t mind correcting some errors in judgment, the thought of re-experiencing high school, acne, and dating makes me cringe. We have five kids in my modern-day blended family, ages 21, 19, 18, 17 and 8. One can legally drink and gamble. Two are in college. Three can vote. Four can drive. And one is still my beautiful cherubic faced, curly haired baby. She will always be my baby, even when she has babies of her own. A few months ago, we made a birthday party for my “baby,” at Chuck E. Cheese. It was crowded and the noise was absolutely deafening. But it was wonderful to see her giddy with sheer delight as she stood proudly in her blue soccer uniform while we sang happy birthday, and she blew out the candles on a Costco buttercream cake. It was her birthday, she turned eight, and she was thrilled. So thrilled that she can’t wait for her next birthday when she will be nine. I have heard time and time again that age is just a number. Well, my baby’s number and the other children can continue to rise, but me – my number is 40. I did it. I set a goal. I accomplished a goal. And it felt great. When I turned my computer off on Tuesday night, I had zero emails in my inbox. Now, I must admit the last stubborn email was turned into a draft so I can easily pop onto it when I want to reference it. By the way, a few people provided helpful suggestions including, Karaboo over at whoorwhatwasthat.wordpress.com. I felt a feeling of exultation. It was a beautiful. Now, it was nearing 11:00, so I could not shout for joy. For if I shouted and awoke the children, there would be no joy in Mudville. However, I certainly could share my excitement with my wife. I was sure my wife would be excited. In fact, when she learned of my goal, she smiled widely. So, I went upstairs. I tried to hold back my excitement as I approached our bedroom door. As I was about to enter, I started thinking. For an organizational fiend like my wife, this news could actually serve as an aphrodisiac. Maybe, she wouldn’t be able to control her enthusiasm. She would have to express her admiration. Whatta man whatta man whatta mighty good man. Whoo ah! Okay, I am mixing my cultural references, but this was good. Zero in the inbox and a night of love. This could inspire me to accomplish many more organizational tasks. I could organize the garage, organize the desk. Things always need organizing. Wait. I stopped myself from entering the bedroom. Let me make sure the kids’ doors are shut. No interruptions – no thank you. Well, the kids were sleeping, and the house was quiet except the television was on in our bedroom. This is good. Feeling confident now. “Were you asleep?” I knew the answer. I hoped she would lie. “That’s great,” she muttered with less enthusiasm than the nominees say at awards shows when asked how they feel after not getting the award. I’m just happy to be nominated. “That’s it?” I was crestfallen. I sighed, turned around, as my sense of accomplishment faded slightly. I headed to the shower happy this night to still be suffering from morning shower phobia. A nice shower would do me some good.